I recently (like last night) started on the Flat Belly Diet. In honor of that, I decided to create a banana bread that would be friendly to my new diet. (By the way, I NEVER do diets. And I am not strictly following this one. But damn, I have to get rid of this belly pooch before Puerto Rico!) I am allowed to have strawberries. Bananas. Dark & semi-sweet chocolate (they call this a MUFA- a monounsaturated fatty acid, supposedly key to losing belly flab). Low fat dairy. Whole grains. 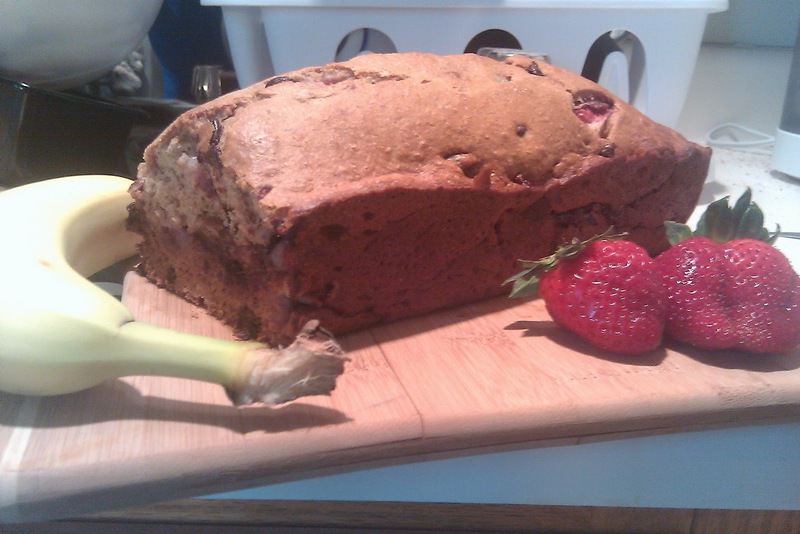 So, why not a Strawberry Chocolate Banana Bread?? I was also inspired by my fave Flat Belly Diet breakfast so far- the whole wheat waffle topped with slightly melted semi-sweet chocolate chips & sliced strawberries. So, to start- Heat your oven to 350 degrees & grease one loaf pan. Measure out 1 cup of white flour & 1 cup of whole wheat flour. (You can do all white or all wheat if you would prefer.) I blended the 2 flours together with a whisk. Add 3/4 tsp of baking soda & a 1/2 tsp of salt to the flour mixture. Set aside. In a smaller bowl, cream together 3/4 cup of sugar & 3 tbsp of butter, slightly melted. Add 1/2 cup of egg whites (I buy the carton in the grocery store- WAY easier. You can also just use 2 whole regular eggs instead.). Mix. Next add 2 very ripe and well mashed bananas, 1 tsp of vanilla extract, and 1/2 cup of lowfat vanilla yogurt to the creamed mixture. Mix well. We are now going to add the creamed mixture to the flour mixture in thirds. Mix well after adding each third. Add about a 1/2 tsp of cinnamon to the banana bread batter. Now for the good stuff! Slice about 7 medium sized strawberries. Cut the strawberry slices in half. Toss into the batter mix. Now measure out 3/4 cup of semi-sweet chocolate chips (Or a whole cup. I didn't see a thing. ;)). Add the chocolate chips to the batter and stir well.